The hilarity of homeschooling never ceases to tickle my funny bone and drive me to a deeper walk with the Lord. When we memorized our states and capitals earlier this year, I made some copywork and maps for the kids to practice on. My son’s assignment this particular morning was to color in the 5 states we were working on, and trace/write each state and capital on the lines below his unlabeled map. He was doing fine until he arrived at North Carolina. He simply could not remember where it was. 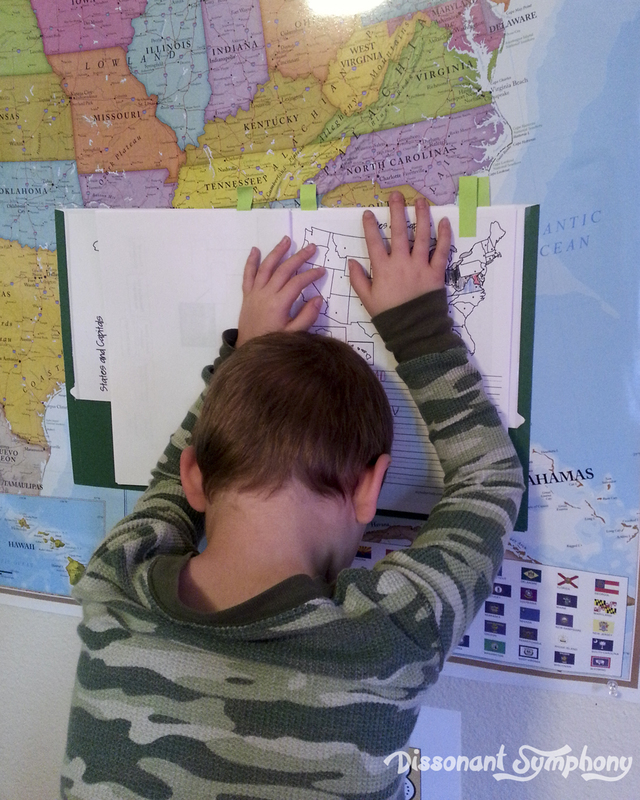 So, I told him to look for the state on our large (labeled) wall map and showed him the general area to focus his search. Ignoring my regionally specific instructions, my little guy’s eyes roamed the entire map, darting from coast to coast. He grew frantic in seconds at the giant map before him before he flung his folder against the wall, hung his head and grumbled sadly “I’ll never find North Carolina. I just can’t. It isn’t here.”. I’m sure I didn’t help this dire situation at all by whipping out my camera, snapping away and struggling to contain my laughter. I just couldn’t help it. Just look at the ends of his fingers. I wonder how often God has a similar view as I throw a tantrum over life’s challenges. How many times do I give up understanding what He’s trying to show me, when the answer is literally right at my fingertips? Sometimes, I get so bogged down in the overwhelming volume of life, that I miss what’s right in front of me. It all seems too big, scary, and beyond what I can handle or wrap my mind around. Suddenly I’m picturing all the ways I can fail at this journey. I get wrapped up in worry that I’m not doing well enough equipping my kids for the world. For life after homeschooling. I go crazy searching the whole country for North Carolina, not realizing I’m already right on top of it. I need to take a step back and realize that all God wants is for me to trust Him for the next thing. To work on a small piece of the puzzle, one state in the union, just the next lesson. That’s it. In those moments, I’m reminded of my verse. The one God poured into my life that convinced me I could be obedient to homeschool and believe I’d probably not die trying. If you are feeling lost today, overwhelmed trying to make sense of it all, remember His grace is sufficient for YOU too. Hi 🙂 We are CC’ers and we LOVED your geo copy work pages (as well as your top-half blank history ones!) I can’t find them for Cycle 1. Maybe I don’t have your upload user name? If you haven’t uploaded, do you think you’ll make more?? Ps. We have this same map! And I had my kids color code the state & print work with colored pencil also so I could be sure they knew which state was which. Such a blessing! That’s exactly how we used them too! Week 1-12 History Sentences + blank top half all done. Enjoy! Hot diggity! Thanks so much! !